The following is a summary post for my i5-3470 build. Unfortunately a lot of the photos didn't turn out all that well, which will teach me for using my phone instead of a real camera. Oh well. Over Christmas 2012 I gathered together parts to build a new computer. Machine requirements: general purpose day-to-day workhorse. 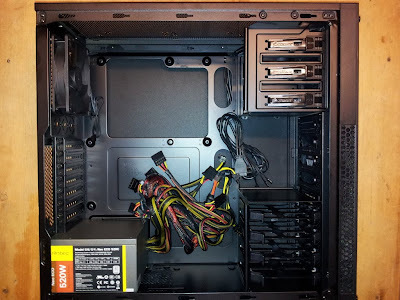 Needs to be able to do most tasks from email/internet, document/artwork creation, software development, light gaming, virtual machines and (possibly) animation rendering. The last two are not going to be often, but it'll need to handle them. The case had a blemish on the inside about where the motherboard would sit (see image). While it might have been an indication that the case was a return and not brand new, everything else seemed fine and I'm not really sure what difference a "returned" case would make. Also, this could have just been a manufacturing thing anyway. This pic also shows up the "bump risers" in the 300R, which comes up later. The box the PSU came in was a little bit beat up, but there was nothing on the inside that made me think it was anything but new. The first step is to mount the PSU in the case and screw it in. This immediately led to the question: PSU fan up or fan down? 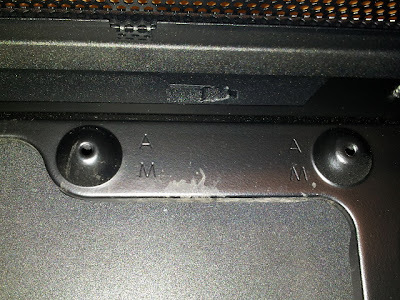 A quick web search suggested that down may be slightly better (potentially lower temps on the system, but also someone pointed out you're less likely to drop small items like screws into the fan). The 300R has a bottom vent, so I decided to go with "fan down". Next potential concern: there was no voltage selector on the Neo Eco 520C. Other (cheaper) power supplies I've used have had selectors. 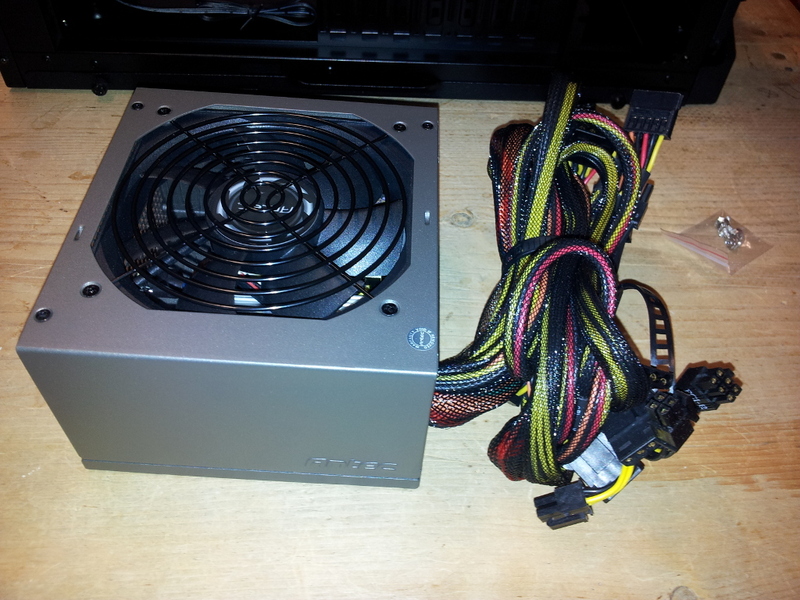 The lack of one suggested that the Antec could handle either 115V or 240V, and reading the labelling confirmed this. So there was no need to "select" an option. It's also worth noting that the Antec Neo Eco 520C (and I guess all Neo Ecos?) doesn't come with a power cable. For me this wasn't a problem since I had half a dozen laying around, but might be a problem for some people. 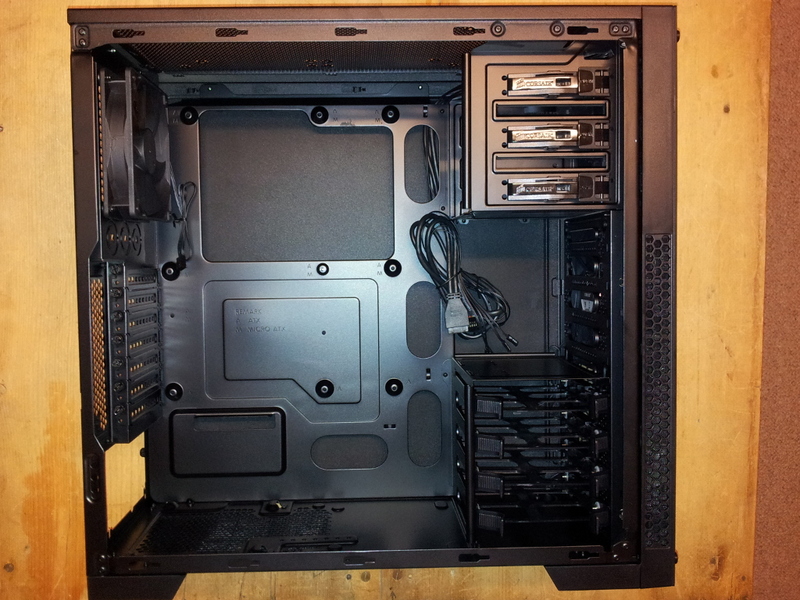 Some people like to install the CPU/heatsink/RAM before putting the motherboard into the case. 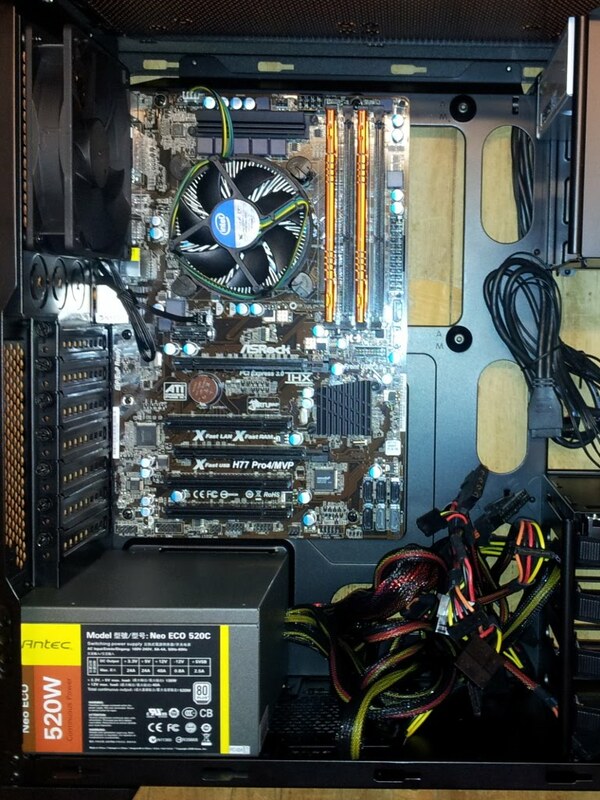 I just whacked the motherboard in there right up front, mainly because I didn't have a place where I felt comfortable putting it to then push and prod other parts into it. 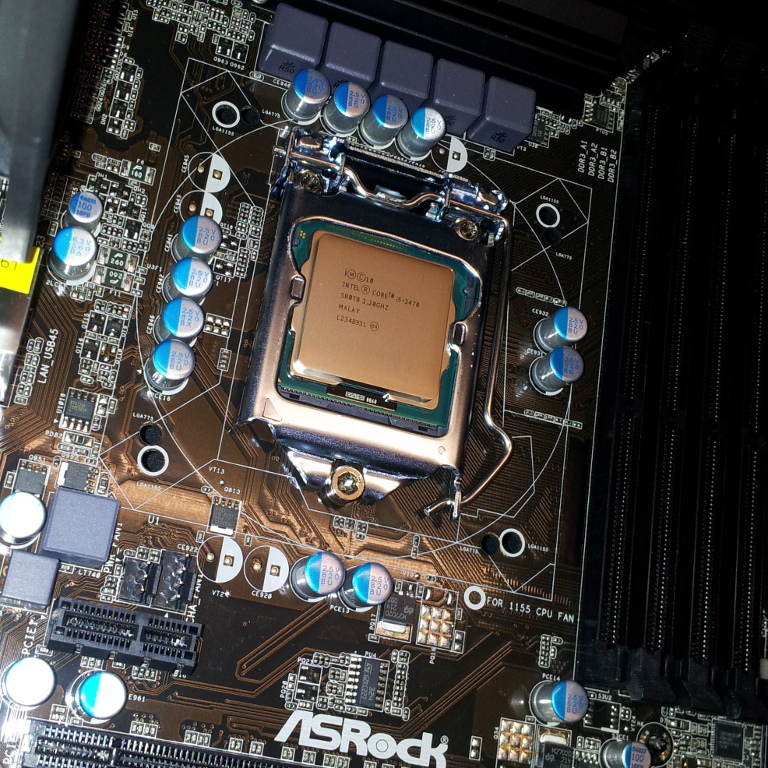 The first issue I had with the motherboard was: where are the motherboard risers? The Corsair 300R only came with one motherboard riser in the pack of screws. 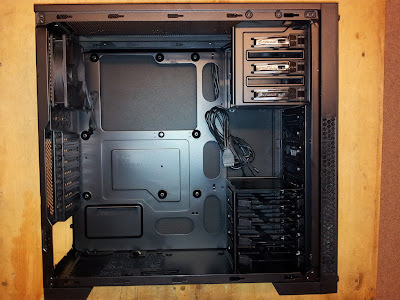 This confused me, since in the past the cases I'd used needed at least half a dozen risers to prop the motherboard up so it wouldn't touch the case and short out. It turns out that the 300R has "bump" style risers, where you don't actually need to screw in anything. Convenient...once you know about it. After that, the CPU went in without an issue. It can only go in one way, you just have to line up the bumps and indentations. The heatsink/fan was a different story. I've done it a couple of times now, so I seem to have a knack for seating the heatsink in such a way that the power cord for the CPU fan won't reach the spot on the motherboard where it plugs in. This time I misread the "CHA1 fan" as "CPU fan", and seated the heatsink accordingly. After realising my mistake, I pulled it off and rotated 90 degrees so it would plug into the correct spot. (Technically, since I pulled the heatsink off after being seated on the CPU, I should have redone the thermal paste, but since the machine hadn't ever been powered up, I felt it wasn't that much of a risk. But I noted it to check the temps first thing after powering on). The only interesting thing with the RAM is that the ASRock motherboard doesn't colour-code the slots like, say, a Gigabyte motherboard. But to use dual-channel, the RAM goes in the same way (that is, leave a gap between the RAM sticks to run in dual-channel). 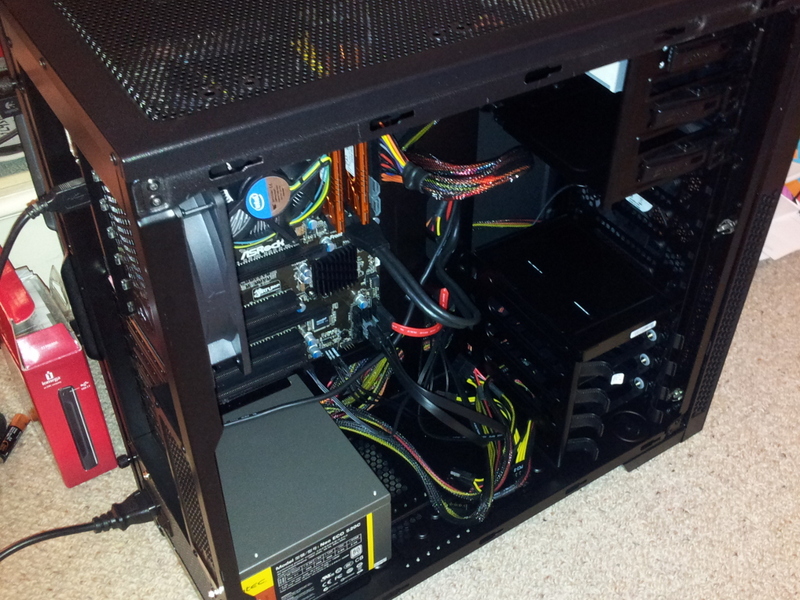 Next was to plug in all the drives (DVD, HDD, SSD), case fans and the front-of-case switches, LEDs and USB cables. 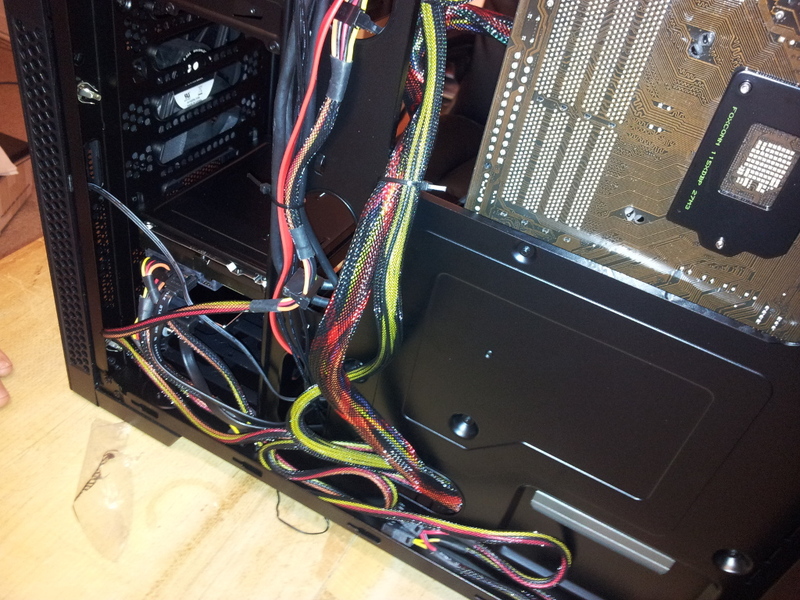 The cabling with the 300R turned out fairly nice, with the USB3 and leftover molex/PCI power cables being the most obtrusive. It really helps having someone else around to hold and adjust cables from one side while you're trying to tie them (thanks Dad). That brings us to the moment of truth: the first power on. I flicked the switch and passed the first test: it didn't explode. However, the power cables for the CPU fan were wound so tightly around the heatsink that they caught on the fan and prevented it from spinning. 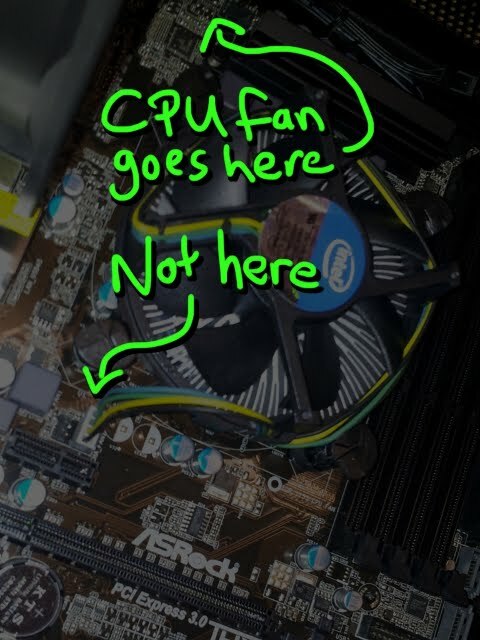 This has happened almost every time I've installed an Intel stock fan, so from now on I check this before turning on. After noticing the fan not spinning, I shut down straight away. Even though the CPU should protect itself from overheating and kill the power, it's not something you want to risk if you don't have to. 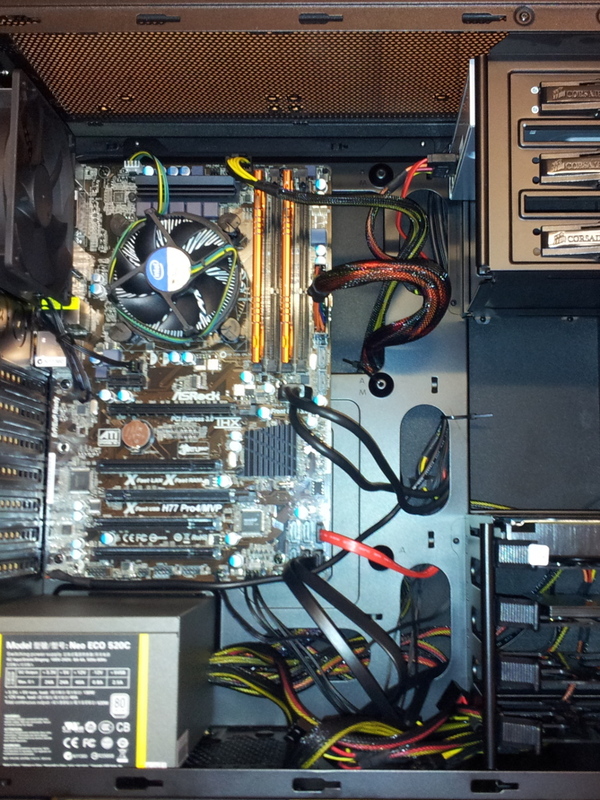 I rearranged the wires of the CPU fan and everything went okay on the next powerup. I'd forgotten that I had a Bodhilinux distro installed on the SSD from when I tested it out in a previous machine. When I turned it on (in this completely new build), it ran up without a glitch. 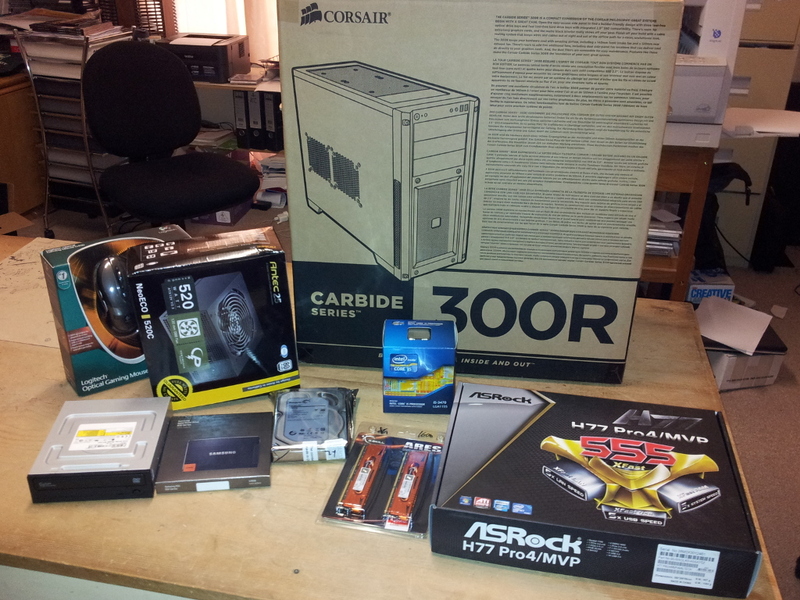 Initial impression of the sound is that the stock CPU fan is a little louder than the i3 3220. May have just been imagination, or something to do with re-seating it, but it's still a bit louder than what I was expecting/hoping for. Overall, pretty happy with the build. Next step is installing (and experimenting) with a GPU while running Linux.